Lake Terusan Kamang is at the foot of Bukit Barisan, about 14 kilometers from Bukittinggi. 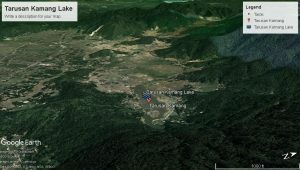 The limestone in Lake Tarusan Kamang is predicted to be around hundreds of centuries old, and has a mineral content of COCA 2. This lake is estimated to have existed since 70 thousand years ago so that no one who built a house on the waterline will turn into a lake. Karst hills on Lake Tarusan Kamang are much older than karst in Java. Karst in Kamang is estimated to have aged 400–300 million years ago because of the trees above it flourished. This lake is unique because it only contains water in certain seasons. One time it looked so wide, but in an unpredictable time, this lake could turn into a stretch of green pasture.